As a web marketer, you can use multiple touch points, like Google Voice, Google+ Events and various others to ensure that your Google+ profile follows your brand everywhere you go. Don’t underestimate the value of using these points for Customer Relationship Management (CRM). Google Voice is the “switchboard” for determining how calls get routed and what numbers they should go through. 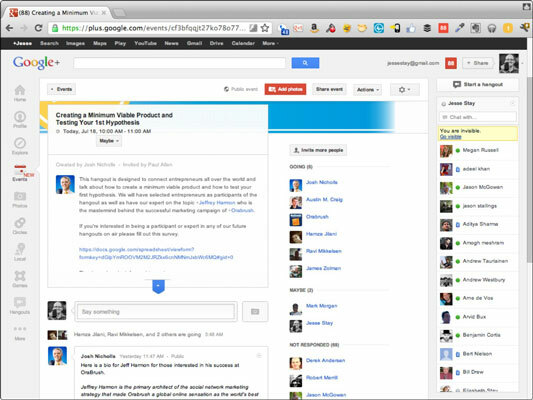 Google Voice also integrates with both Google Contacts and Google+. If someone in a particular Google+ circle calls you on Google Voice, you can select which voice message to provide in reply. You can also choose whether you want your phones to even ring before switching the incoming call to voicemail. This feature is an opportunity to give your customers the information you want them to have, whenever they call so they don’t give up on trying to contact you. Because Google Voice integrates with Google Contacts, you can also get Google profile data about each person calling you. Although Google has not yet integrated the CRM functionality of Gmail with Google Voice, you can click through to any name and see the caller’s record in Google Contacts. Having that additional information can help make the call useful on both ends. 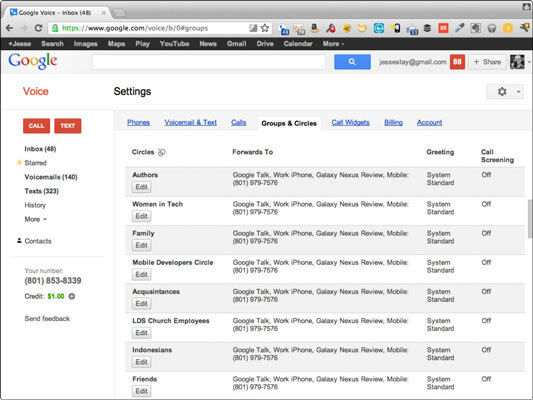 As you find people in Google+, check Google Voice for previous voicemails, calls, or text messages from each individual you circle. You can record calls, and Google Voice also transcribes text messages and voicemails for future reference. You may also want to send these transcriptions to your e-mail so that you can have one central place to search whenever you want to look up information on an individual. Using an Android device with Google+ provides even more CRM opportunities. For instance, you can search for any name by just typing or saying it into the universal search box in Android. If multiple names pop up, you can go through, edit the name right on the device, and even choose to merge fields. Android also allows you to merge the Google+profile with all similar contacts. If you’ve given Android your Google account credentials, it links your Android contacts automatically with your Google Contacts. Then editing a contact on Android also edits the same contact automatically on Google Contacts. Under this arrangement, using Android gives you automatic access to all the contact data you’ve already stored on Google+, including profiles — a CRM treasure trove. Android also integrates seamlessly with Google Voice; after you install the Google Voice app and go through its setup, you can receive calls straight from your Google Voice number, receive voicemails, and call your callers back, all without revealing the original number of your Android device. Although the Google Voice app isn’t nearly as integrated with iOS as it is with Android, you can install it on your iPhone and still get some (limited) functionality tied to Google Contacts. There really are some advantages to using Android when you’re trying to get the “fully integrated experience” from Google. Currently, Galaxy Nexus by Samsung, which Google intended as the flagship product for determining what the Google experience is like on a mobile phone, is the best. Most other phones alter the experience quite a bit. If you’re a fan of Google products, you’ll usually be satisfied by going with Nexus. Google Chat spans both Google+ and Gmail as way to switch quickly from e-mail to real-time chats with the people you’re interacting with. You can chat over a video stream or via text, getting quickly in touch with someone you see either on Google+ or on Gmail if you (or your customer) should ever need a quick answer. 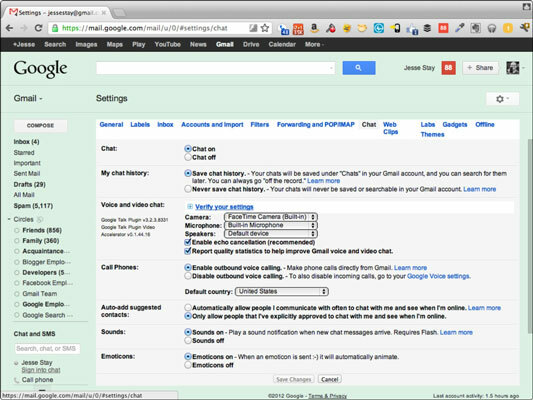 In addition, you can choose to save your chat histories, which then become accessible in Gmail. To make the appropriate Gmail settings, select Chat→Save Chat History and configure any other options as needed. Saving your chat histories gives you a handy resource, as does pushing all your notifications to Gmail: Gmail becomes an even richer storehouse of data about your contacts. Although Google Chat is fine for starting spontaneous conversations, not everyone is always available to chat. Unless a chat’s been agreed upon beforehand, it’s good to e-mail the individual first and schedule a time to chat. In general, treat a Google chat just as you would a phone call or a meeting — schedule it in advance if you need to say any more than just a couple of things. The ultimate way to seal any online relationship is to meet in real life. Google has provided Google+ Events to encourage just that. Try to attend Google+ Events as much as you can. Then, after the event, go to the Google+ Event page: Make sure you circle, and leave notes in your contacts for, each individual you met at the event. You may also consider sending each of them an e-mail through Gmail to thank them for the opportunity to meet. Consider tagging the people you met, as well as yourself, in the photos if the Google+ Events party mode has been turned on and photos are shared. Doing so gives you a photo record of your interaction. If you can’t meet in real life, consider a Hangout. As you join Google+ Hangouts, this is an opportunity to record interactions with each person you “hung out” with. For each person you interact with who joins the Hangout, mouse over that person’s videos and names, and make sure you’ve added him or her to a circle. Also, be sure you leave a note about each person in your Google Contact records; remind yourself of how you met these folks. Then, after the Hangout, go send them thank-you notes in Gmail to add one more record of your interactions with them to your contact information.